If you can’t find this model, try looking for a different Sony Bravia at: Currys, Argos , John Lewis or Very.co.uk. Want to get a Sony Bravia at the cheapest price? Try a price comparison check at Kelkoo, or Pricerunner. We’ve read a number of reviews of the KDL-32S2010 (sometimes just shortened to KDL-32S201), and if you’ve found this page, chances are you’ve already read one or two reviews of this set – they’re all pretty positive! Here, we’ll try concentrate on features, notes and bits of extra information that you may not find in other reviews. Let’s give you a quick summary of our impressions, and what we like about this set. Firstly – it’s excellent. 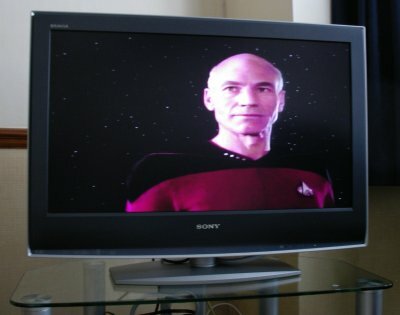 One member of the Radio and Telly team spent a number of weeks searching for a good medium-priced 32″ HD-ready set, and narrowed down the choice – it came down to a Philips, LG or the Sony. A side-by-side comparison showed that on good quality video source, there was no competition – the quality and crispness of this Sony wiped the floor with it’s peers – if you’re looking for a £1000 32″ LCD, at the moment, this is top in this class. If you’re not familiar with Bravia, this is Sony’s LCD engine that powers a range of LCD flatscreens. It offers a faster refresh rate, better viewing angle, reduced power consummation and improved image processing an colour. If you get a chance to visit a TV showroom, and see a Sony Bravia compared with something like PixelPlus from Philips, you should see the difference – more vivid colours and exceptionally sharp pictures. Of course, this is HD-ready, supporting 720 progressive and 1080 interlaced. Looking at the features – well, it has an excellent built-in DTT receiver, for getting access to the free-to-view channels from Freeview – including BBC Three, E4, Film4, BBC News, Sky News, Sky Sports News, ITV2, ITV3, CBBC, CBeebies, etc. There’s also a CAM slot for a subscription services card if needed. The remote has a Guide button that pops up an exceptionally good EPG (Electronic Programme Guide) to help work out which digital channel you need to be watching. The set has a whole stack of features – the automatic setup at first connection was excellent, and required minimal input from us. When watching, the automatic format switching (14:9 , 4:3,or Zoom) works well and adjusts to whatever picture ratio you’re watching. A nice touch is the “Light sensor” – a menu option that allows the telly to detect the ambient light in the room and adjust the picture settings and brightness accordingly. if we have to be critical, the remote is a little ‘boxey’ for such a sleek TV – but it’s well laid out. We liked the prominent ‘Analogue’ and ‘Digital’ buttons, and the fact that it’s not over-cluttered with buttons (as that’s what the menu’s for). 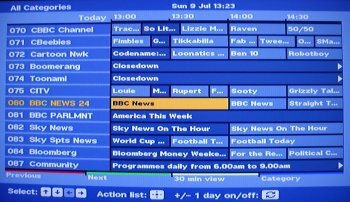 We’re always amazed when we start looking through a TV set’s menu – 10 years ago, you could expect to see “contrast”, brightness” and “tuning”. Now you’ve got a whole stack of other features, settings and gadgets. This TV is no exception, with a good range of preset audio and video settings, such as ‘Picture mode’ (stick with “vivid”), ‘Backlight’, ‘Colour temperature’, ‘Noise reduction’, ‘Auto volume’ (for where ads are louder than shows) and ‘BBE’ audio phase correction. Lots of gadgets to play with, al thought for us, out of the box, picture and sound were perfect, and we’ve chosen not to fiddle too much. As well as supporting Digital Terrestrial TV (in other words, Freeview via a TV aerial), this set also supports good old analogue TV, and have a good number of external inputs for connection to a DVD recorder, satellite TV or Freeview box, camcorder, games console or PC. A nice touch is that can assign an on-screen name to your external sources. Criticisms? Well, apart from a chunky remote control – no. Most reviews we’ve read show this as a 9.x out of 10, and we’d have to agree. For the price, and when compared with TVs in the same price range, it’s a winner. In summary, amazing pictures, great sound, and lots of impressive features and gizmos – from trusted name Sony. Our verdict: A top telly! 2 SCART sockets, both with RGB input (SCART 2 with SmartLink). Getting HDTV To get the most of this TV, you need to connect to a high-definition (HDTV) source. Currently, the top source of HD programming in the UK, is Sky Digital. To get HD channels from Sky, you’ll need a Sky+HD Box (pictured here). The box includes a hard-disc recorder with the Sky+ functionality. Top-Up TV We’ve been asked if this TV supports the extra channels on offer from Top-Up TV. The KDL-32S2010 comes with a CAM slot, so if you buy a plug-in CAM, you should be able to use this with a subscription services card. As of June 2009, no subscription services were available via Freeview, including Setanta or Top Up TV. Warranty / repairs Sony supplies a warranty which covers the cost of repair for 12 months from the date of purchase. 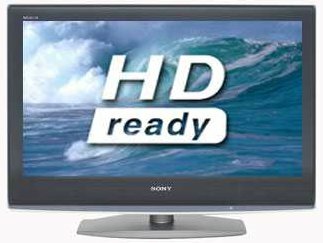 Within the first year, you can contact the Sony LCD TV Helpline on 0870-241 2200 (8:30am-5:30pm) Mon-Fri.
Extended warranties are, of course, available, and given the expense of LCD screens, may be worth considering. 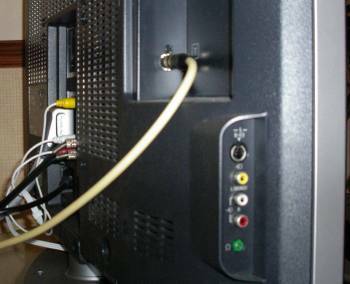 Before spending out on a warranty, check your home insurance, as it may cover your TV – if not, it may be cheaper to extend your contents insurance to cover your new purchase. For home insurance deals, take a look at the ConsumerDeals Insurance page. Aspect ratio We’ve been asked if the KDL-32s2010 can cope with standard 4:3 aspect ratio, as well as the more common 14:9 widescreen. 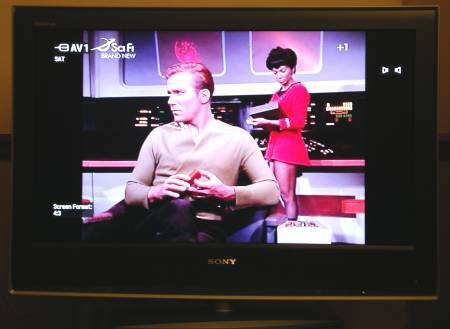 The answer is yes – if you want to see older programmes with the black bars to the left and right (so there’s no stretching), this is supported – there’s a button to change ratio on the remote. There’s also an Auto switch mode. Click here for a photo of 4:3 ratio (with captions turned on – see bottom left for the 4:3 label). Smartlink SmartLink can be found on many new Sony TV (including this one) and DVD/video recorders, and works by ending commands over a SCART lead to other compatible equipment. If you have a compatible Sony DVD recorder, such as the Sony RDR-GX120, you can use Smartlink to record what’s being seen on your Sony TV with a single button-press, or press ‘play’ on the DVD, to have the DVD start playing and switch the TV to the correct Line-In. 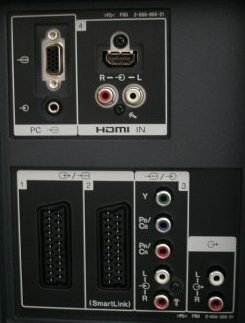 SCART socket number 2 on the KDL-32S2010 supports SmartLink – for connection to a Smartlink-compatible video or DVD recorder.